Samsung: why not run apps on your SSD controller? 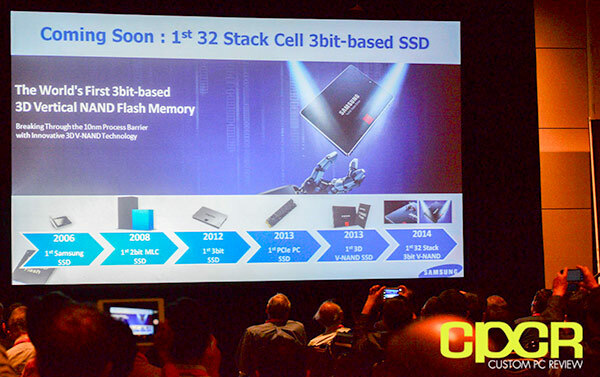 The Flash Memory Summit is currently underway in Santa Clara California and Samsung has had some pretty interesting things to announce and discuss. A Samsung Semiconductor senior VP discussed the 'Intelligent Storage Initiative' which would improve SSD latency and general performance. Also it was suggested that SSD controllers may, in the future, undertake some compute tasks. Samsung has also announced that a three-bit per cell version of its 128Gbit V-NAND flash is just weeks away from shipping. Samsung wants applications and storage to work together more coherently which will make data centres more efficient. In the near term Samsung proposes an 'Intelligent Storage Initiative'. This initiative will facilitate an app telling the SSD controller when it needs greater or lesser resources. So, for instance, your SSD will put off any 'housekeeping' tasks until a quieter time. 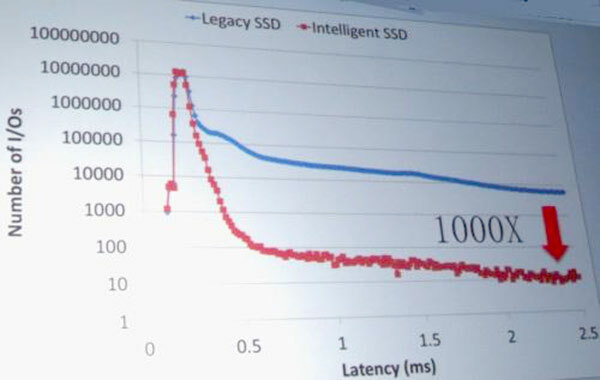 Samsung's Bob Brennan explained "For a fully loaded SSD, if you can control garbage collection at the application level, you get about 1000x reduction in latency". A new working group has been set up to implement this intelligent storage. Looking further ahead Brennan talked about the unused computing capacity of SSD controllers being leveraged to perhaps run storage orientated apps. "There will be hundreds if not thousands of SSDs in the datacenter over time with their processors only busy at peak times," he asserted. Processing right there on the drive could be very efficient with the data to be processed locally. However there are quite a few hurdles to overcome, especially considering the wide range of different SSD controllers on the market. Samsung's most advanced NAND chips are close to shipping, reports the EE Times. Within the month SSDs containing Samsung's new 32-layer three-bit per cell 128Gbit 3D V-NAND should be leaving the factory. Again Bob Brennan explained the advantages of this new tech. This latest NAND development should deliver double the storage capacity yet consume 40 per cent less power than planar NAND chip devices. Brennan expects Samsung to be producing 256Gbit chips during 2015. I think we still have computers in the office doing non-critical tasks (disc duplication, legacy email etc) that probably have less cpu grunt (and ram) than a modern ssd controller. Yep, just checked - the Samsung controller is a triple core 300Mhz ARM9 - the office machines are lesser spec'd. I'm not suggesting we could suddenly turn our SSDs into desktop computers (Pi in the sky? ), but that's a lot of cpu oomph that's just sat there idling most of the time. why not run apps on your SSD controller? Ughhh I can think of several reasons why; security, tampering and stability being somewhere near the top of that list. This is the sort of reason why phones have completely isolated baseband processors, and yet another isolated system in the SIM card. Why not? Because if you have hundreds of drives then they are in a storage rack the other side of a NAS from where the main compute is taking place. You want to send a compute task over a 10GbE network aggregate, through the network switch, through the NAS, through its RAID controller, over fibrechannel to the drive? Lol. Too messy for the data centre, too dull for home use. Hard drives have ARMs in them too. In fact there's probably several ARMs inside your desktop, laptop or server already. Any of them could run apps. They probably shouldn't though, until we're much better at ensuring isolation of critical software and hardware components from non-essential stuff. Why not move the CPU, GPU, cache, DRAM, SSD into modules (a mix of all of them stacked together in a single module). Need more, then just add appropriate module that suits your needs. Network of modules and distributed computing, distributed file system etc. Data storage and movement is the priority and move the processing closer to the memory.